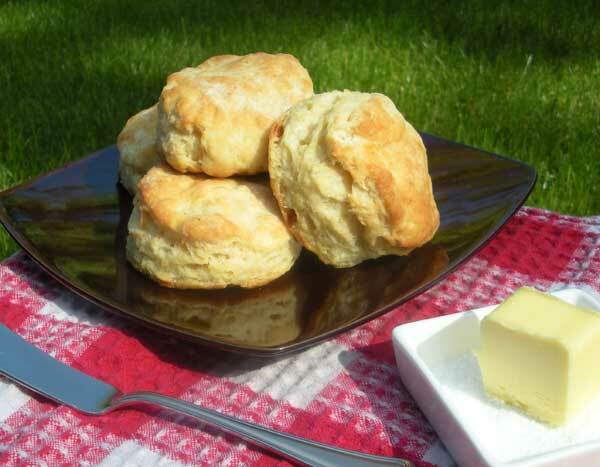 Who doesn't love warm, flaky biscuits? Ah, biscuits. The most basic bread. A ‘quickbread’ as some folks like to call it. I simply call them delicious. Preheat oven to 425. Sift together dry ingredients in a large bowl. Using a sturdy pastry cutter, cut the butter into the flour until all that is left is small pea-sized bits of butter and flour. Don’t overdo it or you’ll have limp biscuits that aren’t flaky. Add milk about 2tbsp at a time and mix in until you have a sticky dough. You may not need all of the milk. Turn out the dough on a floured surface. Keep some flour handy. Re flour surfaces as needed to keep dough from sticking. Roll out the dough by hand in as few movements as possible (knead 3-5 times, tops) until you have a ball of dough. Roll out your dough ball with a floured rolling pin until 1/2″ thick. Using a round biscuit cutter or straight glass (tapered glasses wont do), cut out rounds. Press down and turn only slightly and pull straight up. Use a board scraper or spatula to remove biscuits. Place on an un-greased sheet pan about 1.5″ apart. Brush tops with melted butter. Sprinkle kosher salt on tops to taste. Bake in oven for 10-12 minutes or until tops are just golden. Remove from sheet pan straight to a bread bowl. Serve immediately and enjoy! Great with butter and honey or your favorite homemade jam! Ok so this is a very random post but coincidentally, I ate four of these at a birthday BBQ last night. Great summer food!